Locked to 30 FPS. Game speed is tied to frame rate, therefore, this cannot be easily fixed. Launcher unreadable at 1336x768 and lower resolutions. Vert-. 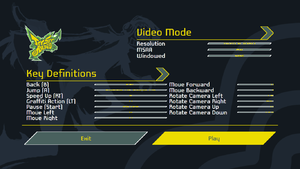 Flawless Widescreen works but causes visual issues. Frame rate is capped at 30 FPS. Game speed is tied to frame rate. Game used to support borderless window, but in a recent update this option has been removed from the launcher so must be set manually. Open setup.dat with a hex editor such as HxD. Write 01 in offset #19. Maps to Xbox 360 controls; mouse can't be remapped. The original version's rumble support has been omitted. Only BGM volume can be controlled. The launcher is unreadable at 1336x768 and lower resolutions. The updated launcher was made for 1920x1080. The lower your resolution, the lower will be the available space for text; at 1336x768 and below, the text is so overflowed to become unreadable. 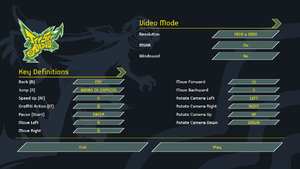 A workaround is to start up jetsetradio.exe directly, though obviously, you won't get the chance to edit the settings. If you have this issue even at 1920x1080, change your text scaling options in Windows back to 100%. 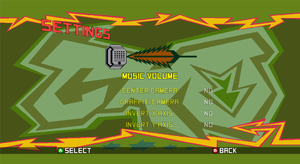 Game creates saves normally; however for some people, if JSR is closed, next time the game is opened, attempting to load a save will result in starting at the first tutorial and overwriting the save. The issue is due to an issue with case sensitivity in the program. 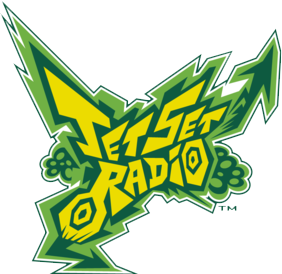 Open jetsetradio.exe with a hex editor such as HxD. Rename the "save" folder in folder 205950 (steam folder) to "SAVE". ↑ 1.0 1.1 File/folder structure within this directory reflects the path(s) listed for Windows and/or Steam game data (use Wine regedit to access Windows registry paths). Games with Steam Cloud support may store data in ~/.steam/steam/userdata/<user-id>/205950/ in addition to or instead of this directory. The app ID (205950) may differ in some cases. Treat backslashes as forward slashes. See the glossary page for details. This page was last edited on 10 October 2018, at 04:41.